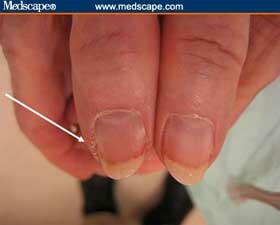 Abnormalities of the nail are often caused by skin disease, infection & medical conditions. 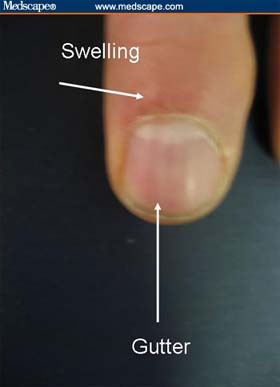 Paronychia is associated with separation of the seal between the proximal nail fold and the nail plate that provides entry for bacteria and leads to a localized infection of the paronychial tissues of the hands (Figure 29). Symptoms may include inflammation, swelling, and/or scaling. Figure 29: Example chronic paronychial inflammation. A mucous or myxoid cyst is a collection of degenerative collagen that can cause swelling and ridging of the nail above the cyst, forming a "gutter" (Figure 30). Figure 30: Example of a mucus cyst.